My plate's still full, so I'm pleased to be able to use today's post to link to an excellent post by my ministry partner Nick Peters on how Norman Geisler has hooked Craig Blomberg over a fishy story -- although actually, Geisler is the one who ends up on a plate garnished with lemon. I have a lot on my plate this week, so this week, I'll just note this place where a reader alerted me to this curious appearance of Tekton in an atheist video. Funny how they end it there, isn't it? In doing my research for the next Building Blocks book, one of my subjects is the nature of hell. I picked up the book Four Views on Hell looking for anything new or useful. I didn’t find anything new, but “useful” worked out a little better. The proponent of the view most like my own is William Crockett, and he made several points similar to my own about the contrary images of fire and darkness. He did not relate the metaphors to honor and shame as I did, but would probably find that agreeable. What interests me more, though, is the response of John Walvoord, who took the point for a literalist reading of hell. Essentially, Walvoord refused to engage Crockett’s arguments about the nature of ancient language (which were much the same as mine) and also did not address the problem of contrary images. Instead, Walvoord opted for what amounted to what could be called a “slippery slope” warning – which is not a real argument, but an implied threat of undesirable results. The Metaphorical View Raises Questions about the Accuracy and Inerrancy of Scripture. It does? How so? Walvoord’s implication here is that a metaphor is an “inaccuracy” whereas a literal reference is an “accuracy”. But that is simply false. What is questioned here is not the accuracy or inerrancy of Scripture, but the accuracy of someone’s interpretation of it. Walvoord’s premise, then, that the metaphorical view means that Scripture does not describe hell “accurately” is also misplaced. Who regards a metaphorical description as wrong because it is literally inaccurate? From here, Walvoord issues what amount to candy-coated threats that this sort of reading will “shut up” the Scriptures, but the reality is that it will open them up – not shut them. The Metaphorical View Requires a Nonliteral Interpretation of Prophecy. Actually, that is a false step; no such “requirement” follows – even though I happen to agree against Walvoord that much end times prophecy IS making use of metaphor. However, in the end of this section, Walvoord turns to ad hominem and claims that people who argue for a metaphorical hellfire just do so because they find a literal hell repulsive. This again is refusing to engage the arguments. The Metaphorical View Lacks Proper Exegesis that Includes All the Pertinent Facts Relating to this Doctrine. Under the honor and shame paradigm, sin is particularly an honor offense against God, in effect an insult to His honor and place by means of disregard of His authority and rules. The paradigm demands that such insults to honor be repaid with shame. In this instance it remains that the value of the response must be equitable -- hence Jesus, in his divine identity, remains the only adequate payment for this honor offense; his blood alone is adequate to take away sin. However, because it is a matter of quality and not quantity, and is an "either-or" rather than a mathematical-value proposition, it is no longer necessary to argue that a sin is an "infinite offense" or to even deal in terms of quantity. Indeed, the matter of quality rests on that while all of God's honor is ascribed (due Him by nature), no ascribed honor of our own can match His (being born into a good family), and we are otherwise only capable of having what they call "acquired" honor. I expect Walvoord was not informed of what relevance honor and shame may have had to this issue; other than that, anything else? No, not really: Other than a few statements to the effect he finds it unbelievable that passages that say “fire” don’t mean literal fire (though I assume he found it credible that passages that refer to metaphorical “water” don’t refer to literal water). With that, we can now engage briefly the reason why I turned this into an E-Block article as opposed to a simple review for one of my blogs. The main point here is Walvoord’s appeal to a “slippery slope” which he apparently felt would cause us to cascade down the whirlpool of misinterpretation. In a sense he was correct, though: Once the door of possibility opens, it does open more. But that begs the question of whether the slope is one we ought to be going down in the first place. Walvoord looks into the maelstrom and sees darkness and death; we see paradise and Pellucidar. I see Walvoord warning us that we should not understand the Bible as people in its day would understand it – though he would not have seen it that way, but rather as taking us away from a proper hermeneutic – that happened to match with modern perceptions as opposed to ancient ones. In the end, the “slippery slope” warning is little more than an attempt to coerce by way of threat that something held dear will be lost. And it is true that some Christians hang on to the modern hermeneutic, kicking and screaming, lest they lose other parts of it as well. On the other hand, much thankful feedback has come my way from persons who saw the dropping of the hyper-literalist hermeneutic as a burden from which they were gladly relieved. And I daresay those reflections were from persons I’d regard as more mature on their faith. This is an ideological battle, however, and we cannot afford to lose it. A church body that will not move off immaturity will not be equipped to equip, much less convert, an entire world. The Gospels Written After 170 AD?? For this round I once again turn the mike over to guest author (and up and coming apologist) Benjamin Stevens, who takes on a familiar face with a wacky claim for us. The infamous Christ-myth theorist responsible for much of the fabricated “facts” in the online documentary “Zeitgeist” has recently contended the canonical four New Testament Gospels were composed after A.D. 170. D.M. Murdock under her alias “Acharya S” published a short article based from her book Suns of God on her website Truth Be Known this January. Though never directly asserting such late dates for the Gospels, Acharya dismisses the typical dating range of the four Gospels (i.e. between A.D. 70-110) as orthodox propaganda and insists: “In reality, the four gospels selected for inclusion in the New Testament do not make any appearance in the literary and archaeological record until the last quarter of the 2nd century, between 170 and 180 CE, and even then they are not much mentioned for a couple of decades.” Acharya argues such by concentrating on the famous second-century Christian apologist Justin Martyr, whom she insists never knew any of the Gospels. Justin Martyr’s silence on the four Gospels becomes her main excuse for questioning the earlier dates of the Gospels. Acharya next hypothesizes Justin consistently showed clear and more exact quotation use of the Old Testament writings, while his references to any verse in the “Memoirs” are “sloppy” if they are in reference to the Gospels. Since Justin could quote more exactly from writings such as the Old Testament, one should expect him to show similar care with the “Memoirs.” Acharya concludes if one accepts this, they must agree Justin used different writings not among the New Testament Gospels. According to Acharya, Justin used the lost Gospel of the Hebrews, Gospel of Peter, and even the Gospel of Nicodemus. But he never used the canonical Gospels. Finally, Acharya responds to the possible criticism that Justin explicitly mentioned the “Memoirs” as being called “gospels” and referenced quotes from them as the “Gospel” on occasion. In response to the charge that Justin in his First Apology calls the “Memoirs” the “gospels”, Acharya dismisses the phrase as “evidently an interpolation”. Acharya defends the point by contending the phrase is “extraneous and gratuitous to the subject matter of the rest of the paragraph.” Acharya complains Justin should have mentioned the phrase elsewhere in his writings if it were genuine. Though Justin used a singular term “Gospel” three times in reference to parallel verses of the New Testament Gospels in his Dialogue with Trypho, Acharya postulates this is only proof of another lost gospel Justin possessed, since he used the singular and not the plural one would expect for four different Gospels. Irenaeus was a contemporary to Justin in the orthodox churches and wrote his work only a decade after Justin’s death. Would Irenaeus gladly accept Justin if he not only was oblivious to the four Gospels in contradiction to Irenaeus’s repeated assertions that everyone in the church accepted them, but believed apocryphal Gospels like Hebrews or Peter were authentic? Justin asserted the “Memoirs of the Apostles” were read every Sunday throughout all the churches in the cities and in the country; the only texts in the succeeding church history that showed such prominence were the New Testament Gospels. How could Tertullian proclaim the old composition and use of the Gospels throughout all the “apostolic” churches extant to verify his claim if they were recent productions? Her theory suffers from additional and unprovable assumptions about later church history for survival. Was Irenaeus just a filthy liar? Did Tertullian fabricate it or were all the apostolic churches oblivious to their own past? One would not have to answer such ludicrous questions if they argued the simpler hypothesis: the Gospels were written decades prior to Justin. Such additional questions demanding an answer would soon show how conspiratorial Acharya’s hypothesis becomes. But I am pointing out the later church evidence as proof one need not engage Acharya’s points to conclude their absurdity. Now I will examine her specific points. If one entertains Justin knew the Gospels, he truly quoted the Old Testament prophets more accurately than the Gospels as Acharya posits. But this proposition does not consider the likelihood Justin memorized the Gospels and was attempting quotes from memory. The title “Memoirs” may be rendered “Reminiscences” of the apostles which signals ancient society’s preference for the “memory” of traditions over written texts. That Justin chose such a title could not be by accident. And considering the popularity of the Gospels asserted by bishops like Irenaeus after Justin, later Gentile Christians cared more for studying the New Testament works. The Old Testament writings represented Jewish texts Christianity was influenced by, but the Gospels were the texts which handed down the genuine words their Christ spoke. When Justin quoted the Old Testament, he likely quoted it from reading it recently ensuring verbatim recall. The Gospels were sufficiently important to Christians for Justin to memorize them; this would more adequately explain why Justin often did not quote them exactly and conflated verses of different Gospels in a harmonious fashion. In addition, most of Justin’s quotes from the Old Testament and the Gospels are in his Dialogue with Trypho. But that work was directed towards Jews and show casts Justin in a heated debate with the famous Jewish teacher Trypho. The main argument disputed in the book was whether Jesus was the predicted Messiah from the Old Testament prophets. This forced Justin’s focus primarily on the Old Testament. Given this context, Justin would have desired more precision with his Old Testament quotation in a work designed to answer Jews by addressing their Scriptures. Acharya’s claim that the real gospels Justin used included the Gospel of the Hebrews, Peter, and Nicodemus appears convoluted and absurd. Among these texts, the only one accessible in its full text is Nicodemus. Acharya uses this Gospel as the parallel to Justin’s few assertions regarding a certain Acts of Pilate. But multiple works under such a title existed in the churches, as Eusebius of Caesarea appeared to show familiarity with different works purporting to show the records of Pilate’s notice on Jesus. Justin never quoted from the Acts of Pilate but only claimed it mentioned some of Jesus’ miracles and his crucifixion. Since Justin never quoted from the Acts of Pilate, one cannot be sure which text he used, as most scholars date the Gospel of Nicodemus in the fourth or fifth century! Justin also mentioned this work in his First Apology where one would expect such a notice to be brought up before a Roman audience if it existed. Yet this would not demonstrate the work was part of the “Memoirs” when Justin distinguished the titles and never quoted from the Acts to prove any parallels. Considering Justin routinely repeated Jesus’s resurrection in his Apologies and Dialogue with Trypho, one would expect him to not gloss over such grand details to a Roman and Jewish audience but, instead, appear to merely quote or allude to verses in the canonical Gospels on Jesus’s resurrection. But Justin never alluded to this significant passage, and any quotation by him from a work on Jesus’s resurrection is paralleled in the canonical Gospels. For this devil, when [Jesus] went up from the river Jordan, at the time when the voice spake to Him, Thou art my Son: this day have I begotten Thee, is recorded in the memoirs of the apostles to have come to Him and tempted Him, even so far as to say to Him, Worship me; and Christ answered him, Get thee behind me, Satan: thou shalt worship the Lord thy God, and Him only shalt thou serve. For when Christ was giving up His spirit on the cross, He said, Father, into Thy hands I commend my spirit, as I have learned also from the memoirs. For He exhorted His disciples to surpass the pharisaic way of living, with the warning, that if they did not, they might be sure they could not be saved; and these words are recorded in the memoirs: Unless your righteousness exceed that of the Scribes and Pharisees, ye shall not enter into the kingdom of heaven. For the apostles, in the memoirs composed by them, which are called Gospels, have thus delivered unto us what was enjoined upon them; that Jesus took bread, and when He had given thanks, said, This do in remembrance of Me, Luke 22:19 this is My body; and that, after the same manner, having taken the cup and given thanks, He said, This is My blood; and gave it to them alone. Finally, the singular use of the word “Gospel” by Justin cannot be used to point to another separate and lost gospel. Church history quickly after Justin revealed how frequently orthodox writers could obviously quote from one of the four Gospels as simply “the Gospel.” Tertullian often referred to the four canonical Gospels under the title “Gospel” when refuting the heretic Marcion. Clement of Alexandria in the same time as Tertullian and Irenaeus affirmed: “Further the Gospel says, ‘that many bodies of those that slept arose,’ (Matt. xxvii. 52).” That Justin could have conceivably quoted from the New Testament Gospels under the singular title “Gospel” is not without precedent in the early church. Justin undoubtedly knew and was familiar with the canonical Gospels. What does this proposal imply? Justin not only referenced the Gospels, but referenced them as widely regarded Christian scriptures. The “Memoirs” or Gospels are practically the only writings Justin employed to his opponent Trypho as worthy Christian literature. If Justin wrote his works around A.D. 150, then the Gospels ought to be placed a generation behind Justin to answer the question of their unquestionable authority and popularity to most of the known churches. This theory would place them no later than the start of the second century or end of the first. Just as Acharya wishes to use Justin primarily in her late dating of the Gospels, so Justin alone may be assessed to date the Gospels to the end of the first century. But this is not to say Justin represents the only shred of evidence for earlier dating of the Gospels. It simply demonstrates how one is ridiculous to argue such late dates as Acharya. The Christ-myth theory has become an internet sensation in the twenty-first century with proponents like Acharya S, Earl Doherty, Richard Carrier, and Robert Price beloved by skeptics to Christianity. Unfortunately, such a non-scholarly theory is beginning to influence even more radical proposals such as this article tweeted by Acharya in January of 2014. But the Gospels were clearly quoted and evinced by the early second-century, which demonstrates earlier use. Most scholars accept a first-century dating for the Gospels because that is what the evidence demands. A work like 1 Timothy was undoubtedly written no later than the start of the second-century, as it was quoted by writers shortly after that date. Regardless if Paul authored it, 1 Timothy 5:18 quoted Luke 10:7 as written “Scripture” already accepted in the churches. Acharya’s assertions that none of the Gospels were so much as known until Irenaeus’s time is debunked and silly. For a skeptic to assert any of the Gospels were written as late as A.D. 170 is nothing short of madness. Murdock, D.M. “The ‘Historical’ Jesus?” Truth Be Known. http://www.truthbeknown.com/historicaljc.htm (accessed 1 April, 2014). Gospel of Peter. Translated by Raymond Brown. Early Christian Writings. Perspectives. Waco, TX: Baylor University Press, 2009. Clement of Alexandria. Stromata. 200. Justin Martyr. First Apology. 150. Justin Martyr. Dialogue with Trypho. 150. Eusebius of Caesarea. Church History. 325. D.M. Murdock, “The ‘Historical’ Jesus?” Truth Be Known http://www.truthbeknown.com/historicaljc.htm (accessed 1 April, 2014). Justin Martyr, First Apology, 67. As one scholar noted: “For Justin, on the other hand, the expression ‘Memoirs of the Apostles’ clearly designates a text, the written deposit of this tradition—though still, it should be noted, a text accessed primarily through the ear, read aloud in public performance, rather than through the eye, in the privacy of the scholar’s library.” Mourner, “Memory and Tradition in the Hellenistic Schools,” Werner Kelber and Samuel Byrskog, ed., Jesus in Memory: Traditions in Oral and Scribal Perspectives, (Waco, TX: Baylor University Press, 2009), 119. Eusebius of Caesarea, Church History, 2.2. Gospel of Peter, trans. by Raymond Brown, Early Christian Writings http://www.earlychristianwritings.com/text/gospelpeter-brown.html (accessed 7 April 2014). Justin Martyr, First Apology, 16. Justin Martyr, Dialogue with Trypho, 103. Justin Martyr, Dialogue with Trypho, 105. Justin Martyr, First Apology, 66. “For it is written in my Gospel that ‘Satan entered into Judas.’” Tertullian, Against Marcion, 5.6. “I say that my Gospel is the true one; Marcion, that his is. I affirm that Marcion’s Gospel is adulterated; Marcion, that mine is. Now what is to settle the point for us, except it be that principle of time, which rules that the authority lies with that which shall be found to be more ancient; and assumes as an elemental truth, that corruption (of doctrine) belongs to the side which shall be convicted of comparative lateness in its origin…. With regard, then, to the pending question of Luke’s Gospel…” Tertullian, Against Marcion, 4.4. Clement of Alexandria, Stromata, 6.6. Polycarp, for example, quoted all three of these “Pastoral” epistles (i.e. 1 and 2 Timothy and Titus) in his short epistle to the Philippines written no later than A.D. 130 though most likely earlier. 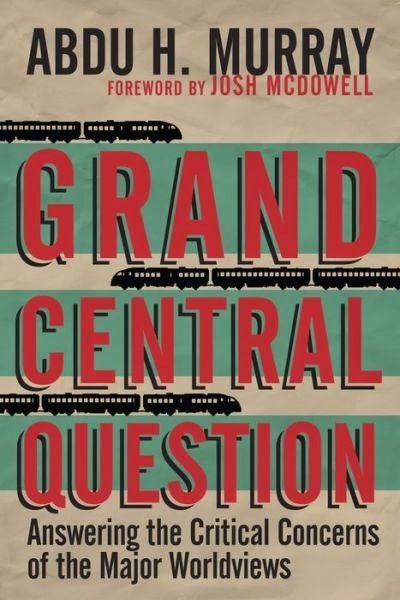 Book Snap: Abdu Murray's "Grand Central Question"
Every gateway apologetics book has a thematic approach that guides the reader. With Lee Strobel, it's the journalist approach; with J. Warner Wallace, it's the approach of the detective. Murray's approach is an interesting double-barrel: He is both an attorney AND a former Muslim. So I don't have to tell you why this is a good volume in terms of the author's qualifications. What I do have to tell you is that this book is more of a philosophical gateway than a "hard evidence" gateway. As the title implies, Murray approaches his topics in terms of "big questions." I'm not as much an expert on these issues, but I'd say based on the presentation and sourcework that Murray's book would be an excellent one to present to the earnest seeker. Give it a shot.